DITLIEBRADIO AND DITLIEB FELDERER REQUEST THAT A PUBLIC, INDEPENDENT GROUP INVESTIGATE THE ACCUSATIONS THAT ISLAM BROUGHT CENSORSHIP TO SWEDEN TO CLEAR THIS MATTER UP ONCE AND FOR ALL! Islam had absolutely nothing to do with bringing Censorship to Europe. The Swedish utterly corrupt politicians are lying through their teeth again and they try to get away with their lies by smearing people who discover how they repeatedly lie to the people. 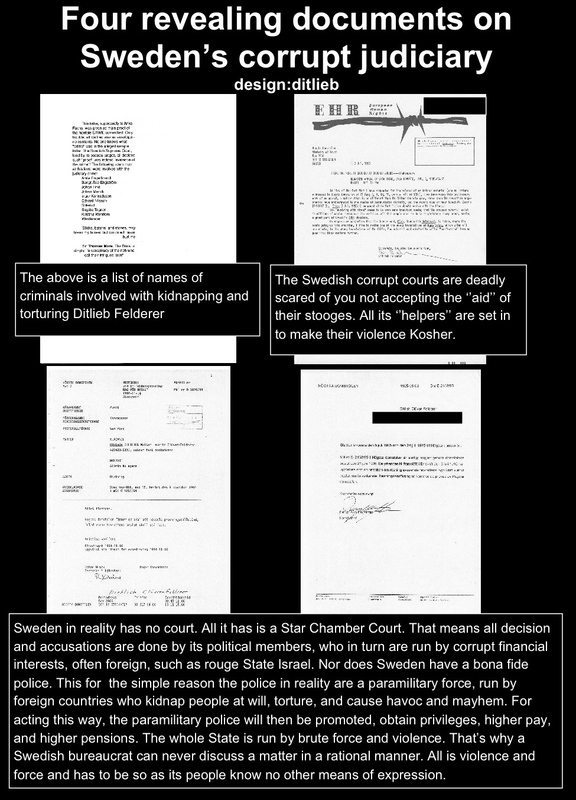 It is a historical fact that Sweden’s corrupt Justice Minister, Herman Zetterberg, at the order of USA Sedition Jews who were all violating their Constitution, brought Censorship to Europe, while enforcing it by incarcerating opponents into Mental Institutions, as they did with Einar Aberg. This was all done to smear him before the public so that the corrupt politicians could in silence and secrecy carry on their Crime Syndicate work. Herman Zetterberg, a drug addict, later committed suicide. 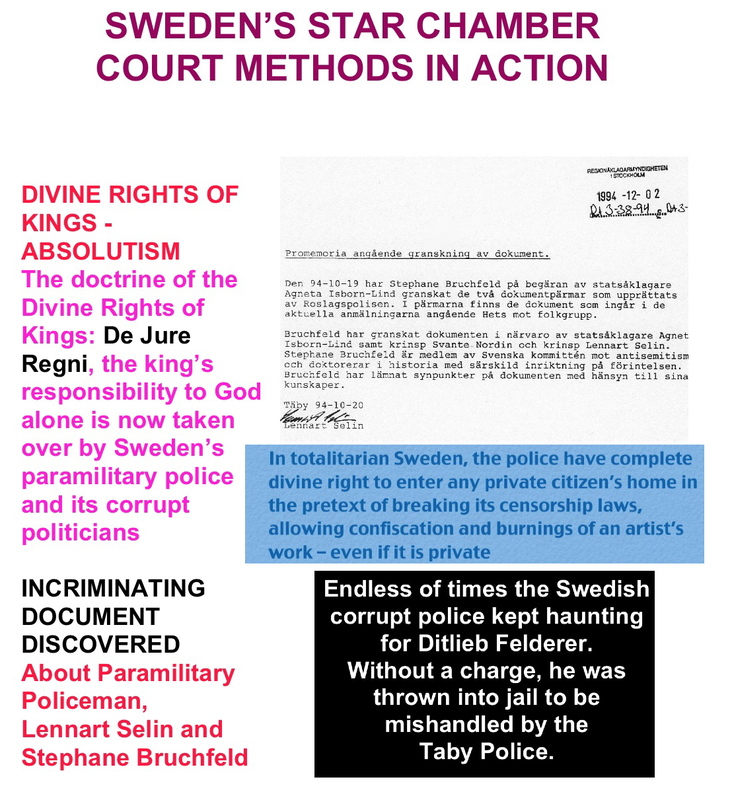 He had for 12 years ruthlessly ruled Sweden’s justice with one corrupt affair after the other. His wife, Ulrika Lyttkens, also a drug addict, also committed suicide. 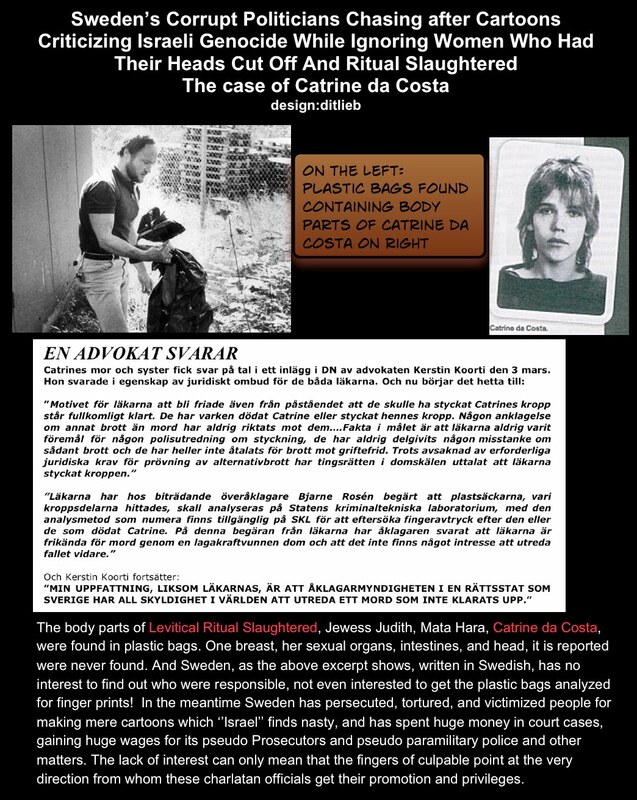 This was hushed up all over Sweden in order not to tarnish the ‘good image’ of the Sweden Justice Minister. His office, Svea Hovratt, still carries on the criminal activities of Herman Zetterberg which has lasted from 1945 till now. It is a known fact that in an act of Conspiracy, France, Germany, and Sweden politicians carried on their secret criminal acts behind the back of the public. Islam had absolutely nothing to do with this. All those who claim that Islam introduced Censorship to Europe are therefore obviously lying. And as these corrupt politicians continue to peddle out their lies about Censorship, we must stand on guard against them as the do everything to conceal their criminal activities and lies in order to cause disharmony amongst the people. NOTA BENE: It should be noted that all of Sweden’s leading politicians are Thought Terrorists (TT), ready to persecute, jail, and torture any person for the slightest cartoon that criticize their evil works and barbarism. Next Next post: Who was telling what? What were the United Nations Secretary-General Ban Ki-moon and Auschwitz Vomitorium Director Piotr Cywinski talking about as they stood before Stalin’s fake crematory ovens?